The Coachella Valley Music and Arts Festival (commonly called Coachella or the Coachella Festival) is an annual music and arts festival held at the Empire Polo Club in Indio, California, in the Inland Empire's Coachella Valley in the Colorado Desert. It was co-founded by Paul Tollett and Rick Van Santen in 1999, and is organized by Goldenvoice, a subsidiary of AEG Live. The event features musical artists from many genres of music, including rock, pop, indie, hip hop, and electronic dance music, as well as art installations and sculptures. Across the grounds, several stages continuously host live music. The main stages are the Coachella Stage, Outdoor Theatre, Gobi Tent, Mojave Tent, and Sahara Tent; a smaller Oasis Dome was used in 2006 and 2011, while a new Yuma stage was introduced in 2013 and a Sonora stage in 2017. On October 9–10, 1999, the inaugural Coachella Valley Music and Arts Festival was held. 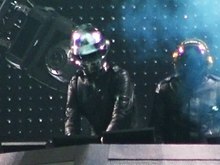 Headlining the event were Beck, Tool, and Rage Against the Machine; other acts included the Chemical Brothers, Morrissey, A Perfect Circle, Jurassic 5 and Underworld. Originally, promoters had hoped to make the event three days (Friday to Sunday) and even considered the UK group Massive Attack as the third-day headliner. The organizers strived to recreate European music festivals with small crowds in a great setting with plenty of turntables. By booking acts based on artistry rather than radio popularity, Coachella earned the title of "the anti-Woodstock". In 2007, Goldenvoice inaugurated the Stagecoach Festival, an annual country music festival that also takes place at the Empire Polo Club the weekend following Coachella. The new event helped avert complications with organizing Coachella; the polo club's owner Alex Haagen III had been planning to redevelop the land unless a new profitable event could be created to make a long-term lease with Goldenvoice financially feasible. Along with the new festival's addition, Coachella was permanently extended to three days in 2007. The headlining acts were Red Hot Chili Peppers, the reunited Rage Against the Machine, and Björk, all of whom headlined for the second time. Other notable performers included Arcade Fire, LCD Soundsystem, Manu Chao, a rare American performance by former Pulp-frontman Jarvis Cocker, and Scarlett Johansson, who sang with the reunited Jesus and Mary Chain. The festival compiled a three-day aggregate attendance of over 186,000, a new best, and grossed $16.3 million. The 2018 festival featured headlining performances from The Weeknd, Beyoncé, and Eminem. Making up for her cancellation the previous year, Beyoncé became the first African-American woman to headline the festival. Her performances paid tribute to the culture of historically black colleges and universities, featuring a full marching band and majorette dancers, while incorporating various aspects of black Greek life, such as a step show along with strolling by pledges. The performances were also influenced by black feminism, sampling black authors and featuring on-stage appearances by fellow Destiny's Child members Kelly Rowland and Michelle Williams as well as sister Solange Knowles. Beyoncé's performances received immediate, widespread praise, and were described by many media outlets as historic. The New York Times music critic Jon Caramanica wrote, "There's not likely to be a more meaningful, absorbing, forceful and radical performance by an American musician this year, or any year soon, than Beyoncé's headlining set". Her performance garnered 458,000 simultaneous viewers on YouTube to become the festival's most viewed performance to date, and the entire festival had 41 million total viewers, making it the most livestreamed event ever. The headlining acts for the 2019 festival are Childish Gambino, Tame Impala, and Ariana Grande. Grande will become the youngest artist to headline the event and just the fourth female headliner of the festival. The 20th anniversary event is set to take place from April 12–14 and 19–21. Kanye West will lead a special Easter Sunday Service performance on April 21, 2019. Tollett begins to book artists for each festival as early as the previous August. In addition to agent pitches and artists discovered online, the lineup is culled from acts booked by Goldenvoice for their other 1,800 shows each year. Tollett uses the promoter's ticketing figures for insight into who to book, saying: "There are AEG shows all across the country, and I see all their show lists and ticket counts. So I see little things that are happening maybe before some others, because they don't have that data." The booking process takes approximately six months. According to the Los Angeles Times, booking fees for most artists playing the festival allegedly start at $15,000 and extend into the "high six figures." Top-billed artists for 2010 were expected receive over $1 million. Billboard's sources estimated that non-headline acts can earn anywhere from $500 to $100,000. According to a 2017 profile on Tollett in The New Yorker, that year's headlining performers received $3–4 million. Beyoncé's 2018 performances and Ariana Grande's 2019 performances reportedly garnered them each $8 million. Cannot perform at any other North American festival from December 15 to May 1. Cannot play any hard ticket shows in Southern California from December 15 to May 1. Cannot "advertise, publicize or leak" performances for competing festivals in California, Nevada, Oregon, Washington, or Arizona, or headlining performances in Southern California taking place after May 1 until after May 7. Cannot announce festival appearances for the other 45 US states until after the January announcement of Coachella's lineup, except for South by Southwest, Ultra Music Festival, and the New Orleans Jazz & Heritage Festival. Cannot publicize concerts in California, Arizona, Washington, or Oregon until after the January announcement of Coachella's lineup, except for performances in Las Vegas casinos. Since 2011, YouTube has live streamed the opening weekend of Coachella. Viewers can choose from three channels of performances to watch. In 2014, AXS TV began broadcasting the second weekend on television; over 20 hours of live performances from the 2015 festival were broadcast on AXS TV. Performances from the 2015 festival were also broadcast live on Sirius XM satellite radio for the first time. In 2019, YouTube will expand its content for the festival livestream, which includes a stream of both weekends of the festival for the first time. 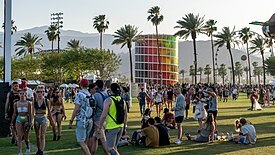 Weekend one will include a premiere of Donald Glover's film Guava Island, while weekend two will feature Coachella Curated, programming hosted by radio personality Jason Bentley that will "take a deep dive into the festival experience" by offering "encore and live performances, artist commentary, mini-docs, animated adventures and more". 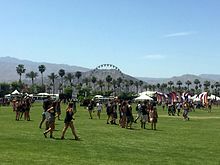 The success of Coachella in its early years proved that American music festivals could work and succeed in a destination form, as opposed to a traveling festival. In the years following Coachella's success, many other festivals have followed in its footsteps, copying its format as a destination festival with multiple stages, attractions, art, and camping. Some of these new festivals have grown to achieve the same success as Coachella, such as, Lollapalooza in Chicago, Governors Ball in New York City, Outside Lands in San Francisco, Stereo Picnic in Bogotá and Bonnaroo in Tennessee, and Stagecoach, a country music festival often considered Coachella's "companion festival" given they are organized by the same company and held at the same location the following weekend. According to a 2015 ranking by online ticket retailer viagogo, Coachella was the second-most in-demand concert ticket, trailing only the Tomorrowland festival. ^ a b Suddath, Claire (April 12, 2013). "Coachella Wins the Fight for Festival Headliners – and Profit". Bloomberg Business. Bloomberg L.P. Retrieved April 11, 2014. ^ a b c Gensler, Andy (February 23, 2017). "Beyonce Cancels Coachella, Ticket Prices Drop 12 Percent". Billboard. Retrieved February 23, 2017. ^ Brooks, Dave (April 6, 2017). "Bonnaroo Places a Massive Bet on 2017 Headliner U2". Billboard. Retrieved April 6, 2017. ^ Sharp, Elliott. "Coachella 2017 Lineup Breakdown". Red Bull. Retrieved January 9, 2017. ^ a b c Brooks, Dave (October 18, 2017). "Coachella Grossed Record-Breaking $114 Million This Year: Exclusive". Billboard. Retrieved October 19, 2017. ^ Hudson, Tanay (April 15, 2018). "Beyoncé's Coachella Performance Had HBCU Vibes And We Are Loving It". MadameNoire. Retrieved April 16, 2018. ^ Félix, Doreen St (April 16, 2018). "Beyoncé's Triumphant Homecoming at Coachella". The New Yorker. ISSN 0028-792X. Retrieved April 16, 2018. ^ Cooper, Brittney (April 16, 2018). "Beyoncé Brought Wakanda to Coachella". Cosmopolitan. Retrieved April 19, 2018. ^ Wood, Mikael (April 15, 2018). "Beyoncé's Coachella performance was incredible – and she knew it". Los Angeles Times. Retrieved April 15, 2018. ^ a b Caramanica, Jon (April 15, 2018). "Review: Beyoncé Is Bigger Than Coachella". The New York Times. Retrieved April 15, 2018. ^ Horowitz, Steven J. (April 15, 2018). "Beyonce Brings Out JAY-Z and Destiny's Child for Historic Coachella Headlining Set". Billboard. Retrieved April 15, 2018. ^ Korosec, Kirsten (April 17, 2018). "How Beyonce's Coachella Performance Broke Records". Fortune. Retrieved April 20, 2018. ^ Honeycutt, Shanté (April 17, 2018). "Beyonce's Coachella Set Is the Most-Viewed Performance on YouTube Live Stream". Billboard. Retrieved April 20, 2018. ^ Mizoguchi, Karen (April 19, 2019). "Ariana Grande and Beyoncé Were Paid the Same for Coachella — $4M Per Weekend for Total of $8M: Report". People. Retrieved April 19, 2019. ^ Brooks, Dave (June 20, 2018). "Coachella's Radius Clause Details Exposed in Legal Fight With Oregon Festival". Billboard. Retrieved April 19, 2019. ^ Shaffer, Claire (April 11, 2019). "YouTube Expands Coachella Streaming: What to Expect, How to Watch". Rolling Stone. Retrieved April 12, 2019.